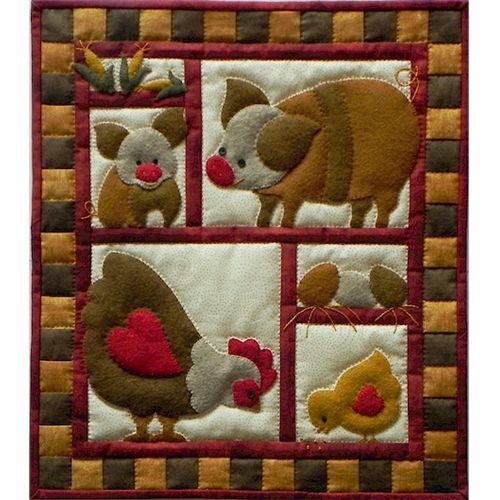 Order a made up sample model herePlump and porky pig and piglet happily share their space with a plucky farm hen and chick. Any thoughts of impending ham are far away. A clutch of eggs and a bit of corn complete the scene. All are contained in a pieced checkerboard border. 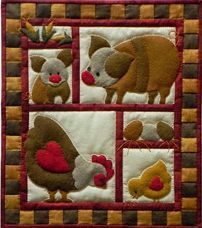 Finished size is 13â€� x 15â€�.Kit includes all woolfeltÂ® for applique all fabrics (100 % cotton) for background borders back and binding batting buttons for eyes embroidery floss precise patterns and complete illustrated instructions. Colors are warm browns and golds off white sandstone red and green.